Horseshoe Bay Settlement. Horseshoe Bay was supposedly named by Increase Claflin, an early Door County settler, who was required to re-shoe a horse near the Murphy Park shoreline. Just south of Murphy Park, a thriving lumber town called Horseshoe Bay Settlement sprang up in 1870. When Egg Harbor was merely a fishing hamlet, Horseshoe Bay Settlement had a school, general store, post office and close to 40 inhabitants. Selling cord wood and wooden barrels in-season, and cutting and storing ice in the winter, the business and community existed until 1890. Murphy Family: Entrepreneurs, Philanthropists. 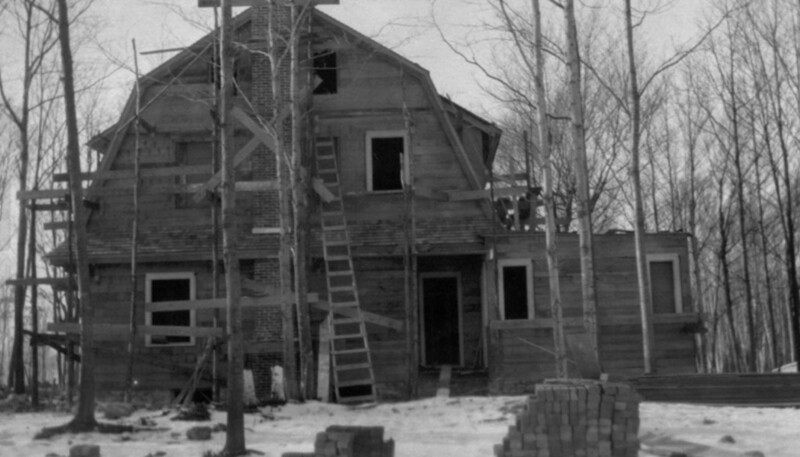 Simon Murphy, the family patriarch was a nationally recognized lumberman with vast timber holdings and sawmills in Wisconsin, Michigan and California. Simon and his 5 sons were successful entrepreneurs, investing not only in their lumber operations, but also banks, insurance companies, the Ford Motor Company and a host of other business ventures. They were also great community minded philanthropists building hospitals, creating parks and serving in governmental positions around the country. UFGC: Tourist Industry Pioneers. One of Simon’s sons, Frank Murphy, was sent by his father to run the lumber business in Green Bay. While in Green Bay he started and ran several additional successful businesses and sat on the city council for 3 terms. In partnership with several other businessman, he was instrumental in forming a real estate development company United Fruit Growers Company (UFGC), buying 850 acres of prime land encompassing 8,300 shore feet on Green Bay just south of Egg Harbor. Their vision was to create a summer home development and private country club. UFGC built a new clubhouse, designed the golf course and began selling lots in 1914. Unfortunately, insufficient lots and memberships were sold to realize the development vision, and the property was sold by the partnership to Frank Murphy in 1916. Murphy Farms: Early Dairy Farm Industrialization. Sitting on a large amount of unproductive land, Frank Murphy proceeded to build a state of the art dairy farm in 2 years (1916-17) that included 8 barns, 5 support structures and 5 farm houses. The farm was laid out with precision and focused on labor efficiencies. All buildings had hot and cold running water; all had electricity; all farm houses had indoor toilets and septic systems. The farm was completely self sufficient with it’s own power plant, food gardens, root cellar, cattle, pigs and chickens. Many dairy farm industrialization ideas that became common practice decades later were in use at Murphy Farms prior to 1920. Frank Murphy also began planting cherry and apple trees on the bluff overlooking the farm complex. Murphy Farms: Holstein Breeding Specialists. Frank Murphy built the Farm with the intent to produce pure bred Holstein-Friesian cattle. The first bull was purchased for $20,000 in 1919. The farm’s reputation grew as they pioneered selective breeding concepts that created ever more productive dairy cows that could be sold at auction. The farm boasted the 3rd largest milk producer in the world; the first cow to produce 30,000 pounds of milk in Wisconsin; and the largest dairy cow in the world (2,240 pounds). In 1925, tragedy struck the farm when one of the bulls contracted Bangs disease, infecting a large portion of the herd. Over 70% of the herd was put down and the breeding operations came to an end. “The Great Horseshoe Bay Farms of Egg Harbor.” With the abrupt conclusion of the breeding business, the emphasis turned to the orchard operations and Frank Murphy renamed the farm: Horseshoe Bay Farms. Over 450 acres of cherry, apple and plum trees were planted on the bluff. Dairy, beef cattle, hogs and chickens were also raised and sold. The farm was home to 3 or 4 families at any one time who worked and managed the farm on behalf of Frank Murphy and later DR. Robert Cowles, who married Frank’s only daughter. Anyone down on their luck and needing a place to stay for a few days or a job, eventually landed at the farm. 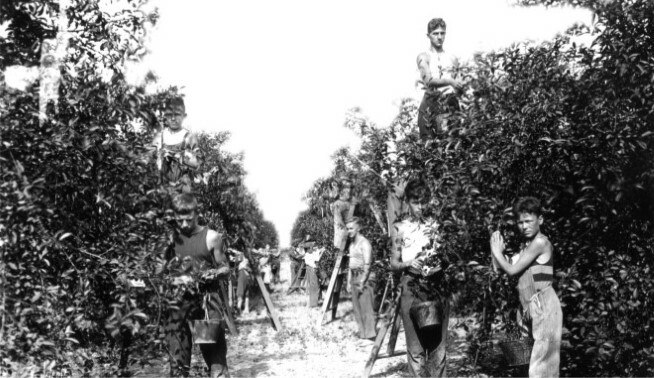 Horseshoe Bay Farms became the largest seasonal employer in Door County for several decades. Door County residents and local newspapers constantly referred to the farm as ‘The Great Horseshoe Bay Farms of Egg Harbor’. Cherry Camp. The Cowles family created the idea of Cherry Camp, a 2 week experience on the farm for 13-17 year old boys from around Wisconsin. The original UFGC clubhouse was converted to a dormitory that housed over 100 young men. All were required to cover their daily room and board by picking 40 pails of cherries at 5 cents per pail. Upon meeting their quota, the boys were allowed to swim, fish, play baseball and enjoy the Door County summer. A number of planned social activities were also available. One of the big camp draws included the camp counselors, several of whom were Green Bay Packer players looking for off season work. Thousands of boys from around the area and state left Door County with wonderful memories of their Cherry Camp experience. Tecumsah Cave. Legend has it that Potawatomi Chief Tecumsah was being chased by the Menominee Indians on Green Bay when he put ashore near Murphy Park and hid in a cave halfway up the bluff. The Menominee’s walled Tecumsah in the cave and left him behind to die. One year later the chief appeared in another part of the state. Did he find another passage out of the cave or is this part of the Door County lore? Tecumsah or Horseshoe Bay Cave as it is now called is one of the more treacherous caves in Wisconsin, with only 50 feet of walking passage but over 3/4 of a mile of agonizing crawlways. The crawlways connect 56 rooms. Horseshoe Bay Cave is also home to a large habitat of over 1,200 bats. HB Golf Club: Realizing Frank Murphy’s Dream. In the mid-1990’s the descendants of Frank Murphy proceeded to realize his dream of creating a seasonal home development and a first rate golf course. Horseshoe Bay Farms development consisted of 7 unique communities. Homes began selling in 1997. The golf course opened in 2000 and has consistently been ranted one of Wisconsin’s best. National Register of Historic Places. In 2012 Horseshoe Bay Farms was placed on the Wisconsin and National Historic Registers. The farms were recognized for their historical significance: as a major breeding farm for Holstein-Friesian pure bred stock; for their apple, cherry and plum orchard operations. The Farms were also recognized for their architectural significance as the largest intact farm complex in Wisconsin, containing both historic agricultural out buildings and five houses designed to house farm personnel.